viaLibri ~ Sentimental Education: A Young Man's History. Sentimental Education: A Young Man's History. London: H. S. Nichols Ltd,, 1898. Authorised Edition. Translated from the French with an Introduction by D. F. Hannigan. 2 volumes, octavo. 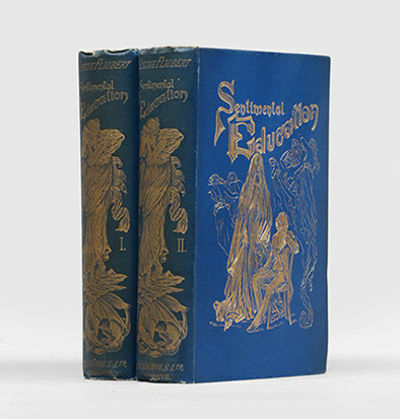 Original blue cloth, spine and front cover lettered and decorated with vignettes in gilt, top edge gilt. Vignette title page in each volume, 16 engraved plates by S. Gorski. Extremities and joints rubbed, text block toned, a few points of loss to tips of leaves. A very good copy. First edition in English. It was originally published in French in 1869. This translation is by the Irish-born barrister D. F. Hannigan, who also translated La tentation de Saint Antoine (1895) and Bouvard and Pécuchet (1896).